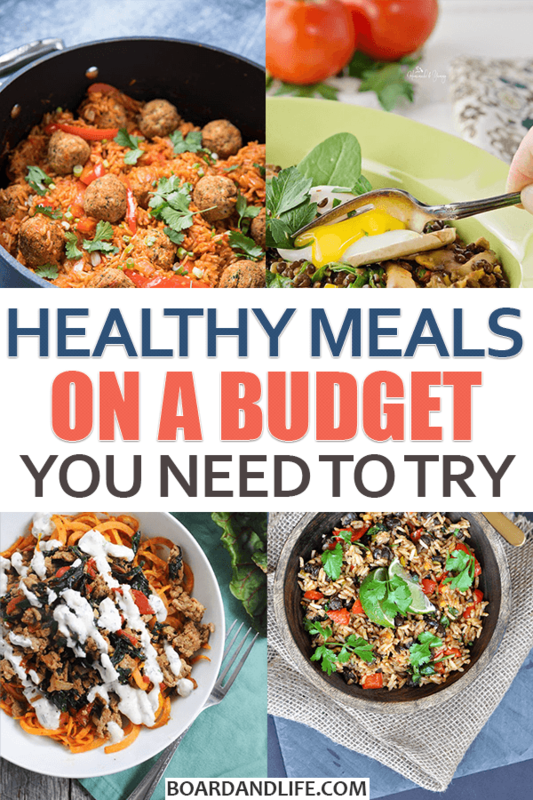 Some Healthy Meals on a Budget For You To Try! Looking for healthy meals that won’t break your wallet? So are we! People often think that healthy meals can’t be cheap meals as well – and this needs to change. With a little planning – like doing meal prep for a week – there are definitely ways to eat well and stretch your dollars! We eat pretty well now – but we definitely felt the health and finance pinch when we were in university. College students are prime for thinking about recipes that get good food into you without spending an arm and a leg on groceries. So, we’ve asked some foodie bloggers what their take on cheap and healthy meals are – and this was their response! Whether you are cooking for one, for two, a family, or even to try and lose weight – here are some great cheap easy meals on a budget! Generally, healthy meals are balanced, full of fresh ingredients, and lack processed elements. We’re not opposed to recipes with a little bit of meat in them – so long as they are lean meats, ideally organically raised and fed, and prepared in a healthy way. Here are some great healthy meals on a budget that incorporate a little meat into them. Are you looking for a lighter meal that would be perfect for spring and summer? 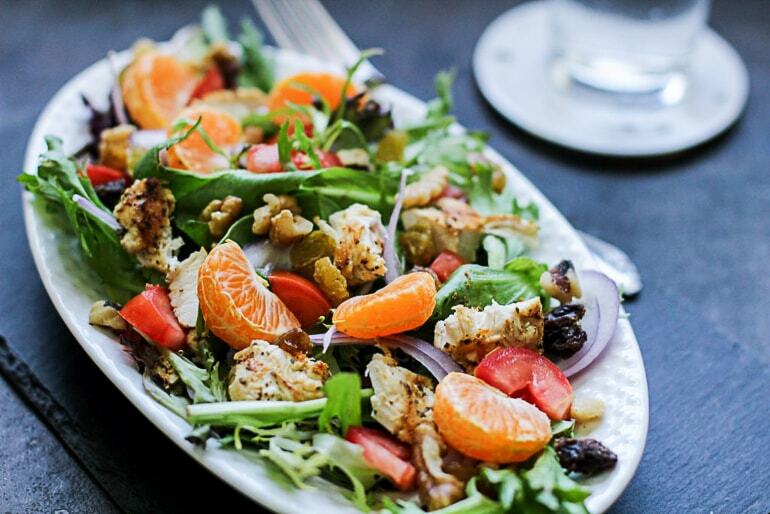 Then give this Easy Grilled Chicken Tangerine Salad a try! You don’t have to cook anything except the chicken (which also makes it a perfect meal if you are in a time crunch) and the tangerine adds a unique fresh flavor to it! 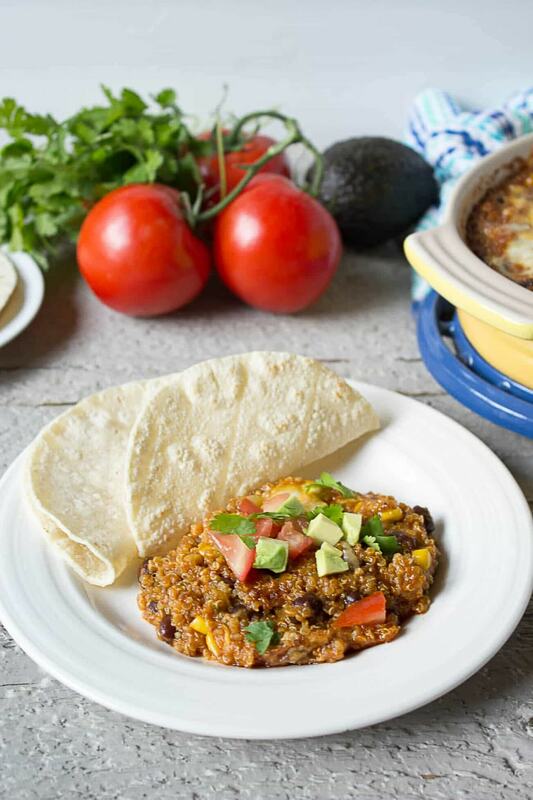 You can find this awesome healthy recipe by Latina Mom Meals here. 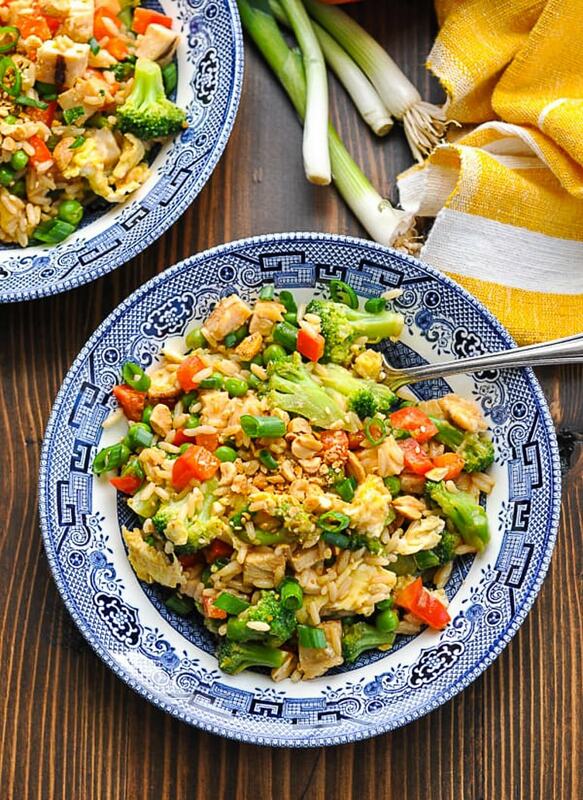 We’re both huge fans of fried rice – but sometimes it is nice to mix it up. And this delicious looking fried cauliflower rice is definitely a healthier alternative to the classic Asian takeout. Another big plus is that it is super affordable – with a serving costing you less than $2.50 – so give it a try! You can find this awesome healthy recipe by The Fit Cook here. Are you looking for a healthy and easy to make recipe for the chillier months? 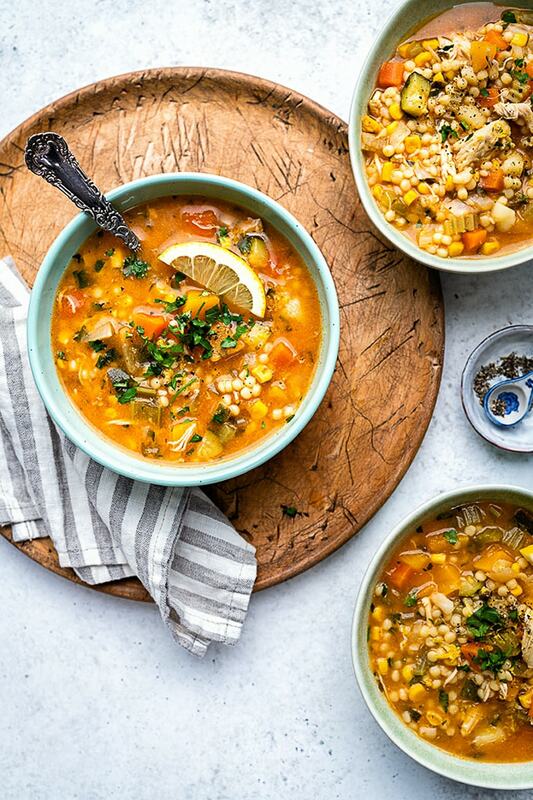 Then this hearty chicken vegetable soup is for you! It’s also great for leftovers since you can just cook a big pot and then eat it over a few days. Convenient, healthy and affordable – this might just become one of our new go-to recipes! You can find this awesome healthy recipe by Supergolden bakes here. Bruce is a big fan of turkey and Lisa loves sweet potatoes so this sounds like the perfect dish for us. The spices are pretty easy to get a hold of and when used in combination (like fennel seeds) they create a distinct taste. We also have a spiralizer (and love using it pretty often) so this would be a great way to incorporate it! You can find this awesome healthy recipe by Two Lucky Spoons here. We actually do up fried rice more often than we might like to admit – but we usually incorporate as many fresh vegetables as we can! This recipe takes it to another level – with a Thai peanut sauce that sounds absolutely delicious. You can easily switch up the protein (and even the choice of rice) so this is a dish that can be made exactly how you like it! You can find this awesome healthy recipe by The Seasoned Mom here. While we have aimed to reduce our meat consumption in recent months, Bruce is still a fan of bacon. Used in moderation, we have no problem adding it to dishes every once in a while. This salad recipe is no exception. 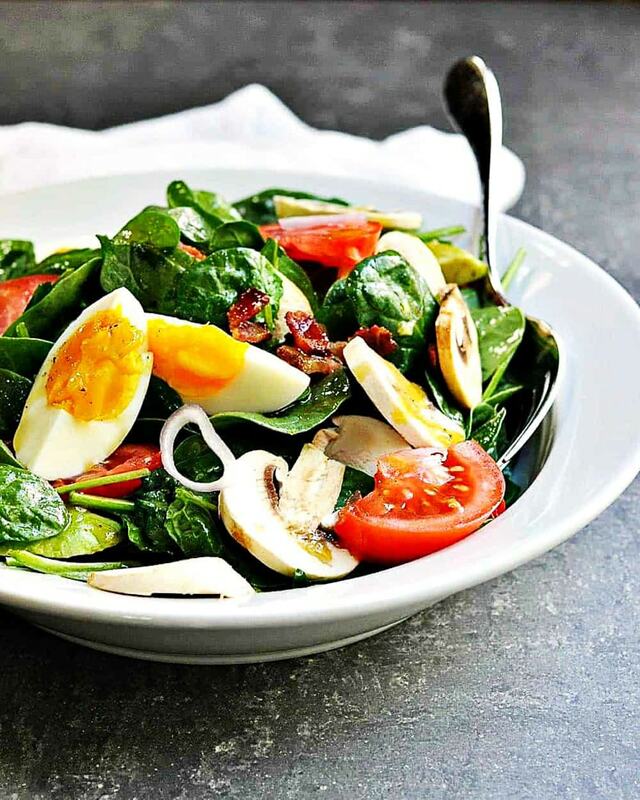 With eggs for additional protein, leafy green spinach, and vegetables (like tomatoes and mushrooms) it sounds like the perfect combination. Give it a try and see what you come up with! You can find this awesome healthy recipe by Pinch and Swirl here. Full Disclosure: we don’t actually have an oven right now (but we are looking to buy a small one). We used to have an oven in our old place and would use it for roasted dinners often. There’s just something about oven potatoes that we love (well, Lisa really loves them!). 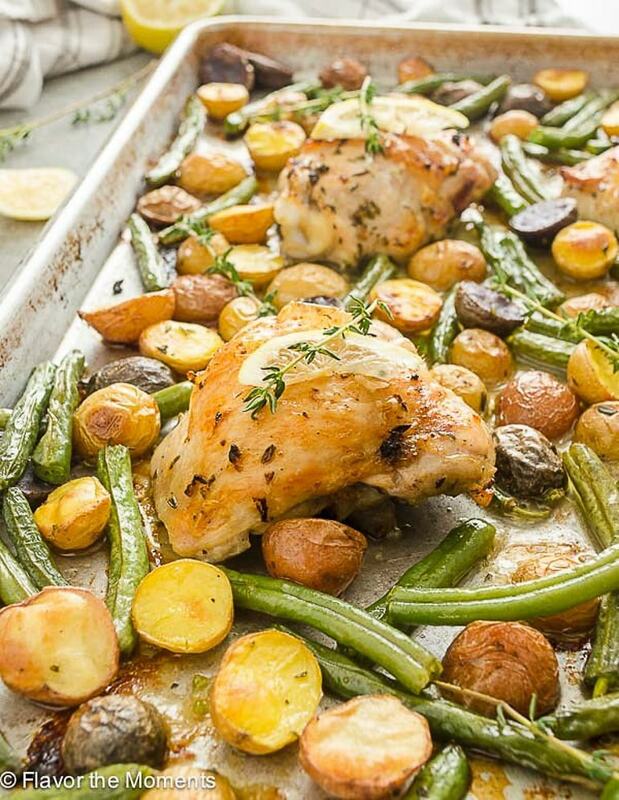 This recipe is a simple hearty meal idea all loaded onto a pan. A little citrus and thyme can go a long way. The pan also makes for easy prep and easy clean up, too! 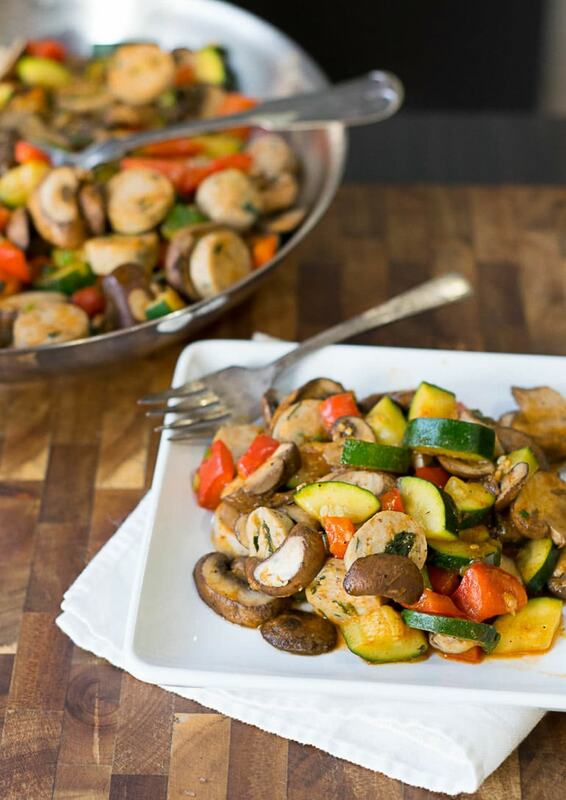 You can find this awesome healthy recipe by Flavor the Moments here. If you are looking for a simple sauté that can be on your table in under 30 minutes, this recipe is for you. The recipe uses a natural chicken sausage which is a great way to substitute for a leaner meat. Also, this recipe is gluten and dairy free – making it a clean and filling source of protein and vegetables. You can add a slice of crusty bread to the meal if you need it to go a bit further! You can find this awesome healthy recipe The Fit Cook here. 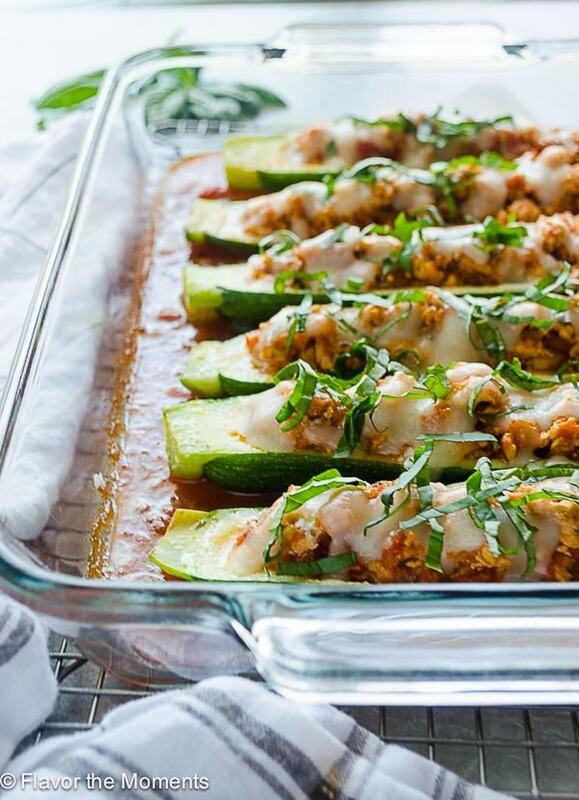 If you want the goodness of chicken Parmesan in your life but want to take it to the leaner side, these creative zucchini boats might be for you. They are gluten-free which is nice – and the recipe even reuses the zucchini parts you remove from the halves so as to not waste the nutrient-rich cores! Healthy meals are easy to whip together when you have vegetables available. The common myth is that vegetables are expensive and thus unattainable for common meals. We think this is untrue. There are absolutely ways to stretch your budget and still include fresh, raw ingredients! Here are some great healthy meals that are totally vegetarian. Goat cheese is an ingredient that we find people either love or dislike. We’re fans – but it’s fine if you aren’t! In any case, here’s a delicious recipe that takes no time at all. 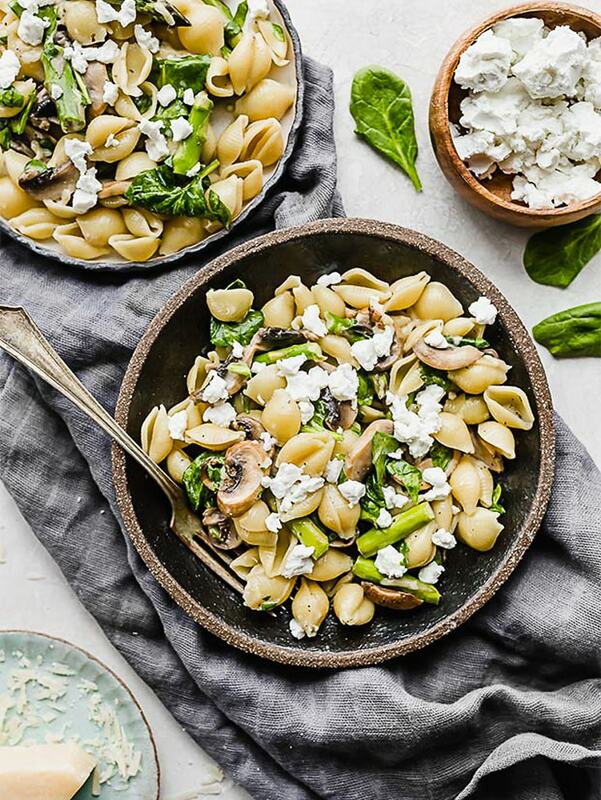 It’s great because you can swap the pasta for whole wheat or add another vegetable (like broccoli) if mushrooms and asparagus aren’t enough. We really like asparagus, though so this recipe will be on our dinner table soon! You can find this awesome healthy recipe by Salt and Baker here. Recently, we’ve become a fan of switching out our grains – and quinoa has come on the menu in our house. That said, we want to try out this recipe! Apparently it also goes well as a dip with tortilla chips – which we can totally see. The recipe calls for loads of cheese and optional garnishes like cilantro which you can swap out if you aren’t a fan! You can find this awesome healthy recipe by Beyond the Chicken Coop here. Bruce really likes soup – he’s just a fan of hot, flavorful broth in various combinations. 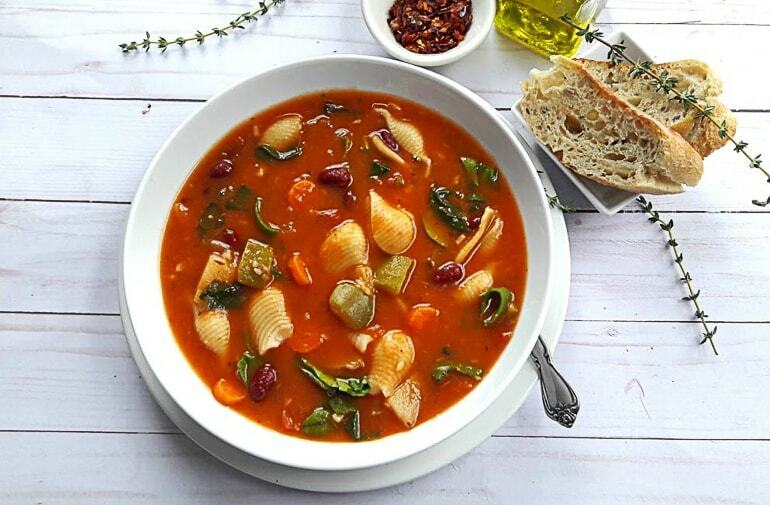 So, naturally, an Italian minestrone would be right up his alley! This recipe is done with low sodium veggie stock which is nice since salt can creep into your diet very easily without realizing. It can also be done in a slow cooker rather than stove top if you want to “set it and forget it”. It’s also easy to turn vegan if you don’t add any cheese to it. 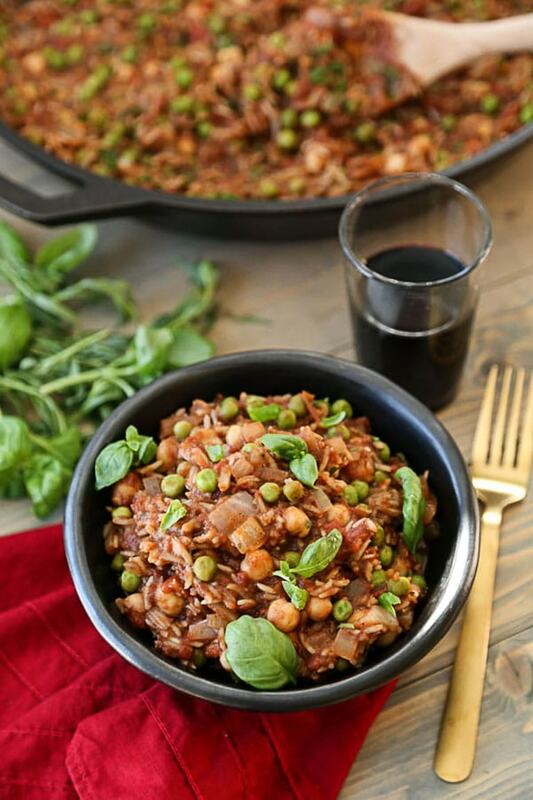 You can find this awesome healthy recipe by Profusion Curry here. 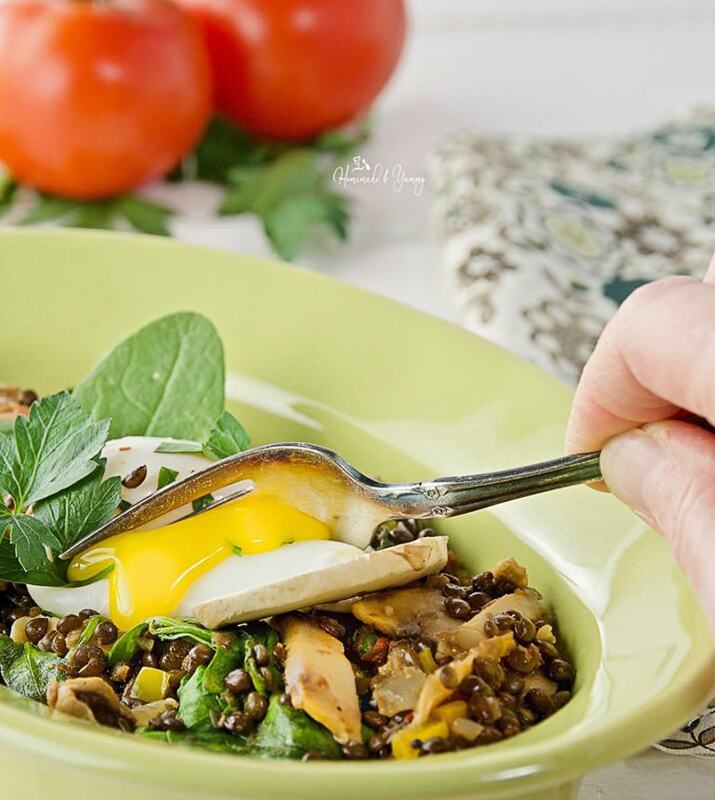 If you want a dish that fits the bill for lots of different times of the day, this poaches egg and lentil hash is for you. The use of lentil means that it’s a hearty dish that is gluten-free, meatless, and fulling. Really filling. Also, lentils don’t have to be scary – you can use them canned or from dry! The recipe also calls for sriracha (which we are a fan of) and is loaded with veggies, too. You can find this awesome healthy recipe by Homemade and Yummy here. If you didn’t already tell, we think lentil are great – and included a variety of recipes that make use of them! 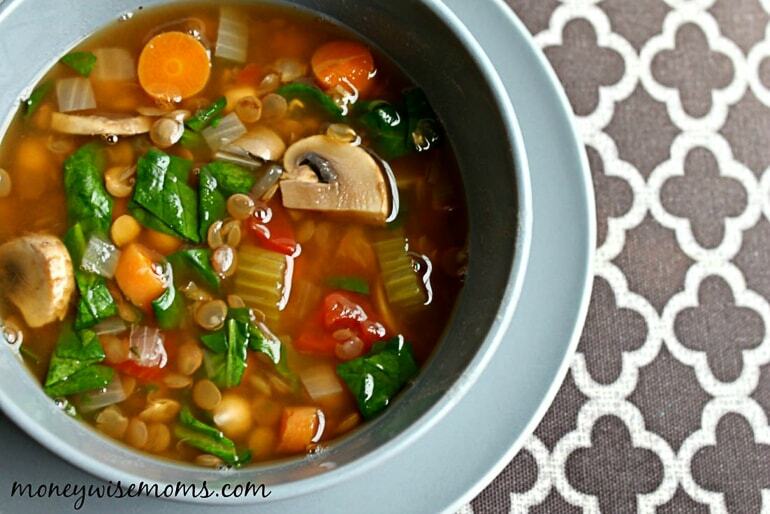 This lentil vegetable soup is no exception – easy to make and very filling. It lasts in the refrigerator for a few days making it easy to munch on if you’re feeling lazy later on! A nice thing about this recipe is that it can easily be made vegan if you don’t include the cheese (or just use an alternative). You can find this awesome healthy recipe by Moneywise Moms here. This Middle Eastern-inspired dish is actually pretty easy to put together and can be customized with a variety of dipping sauces. 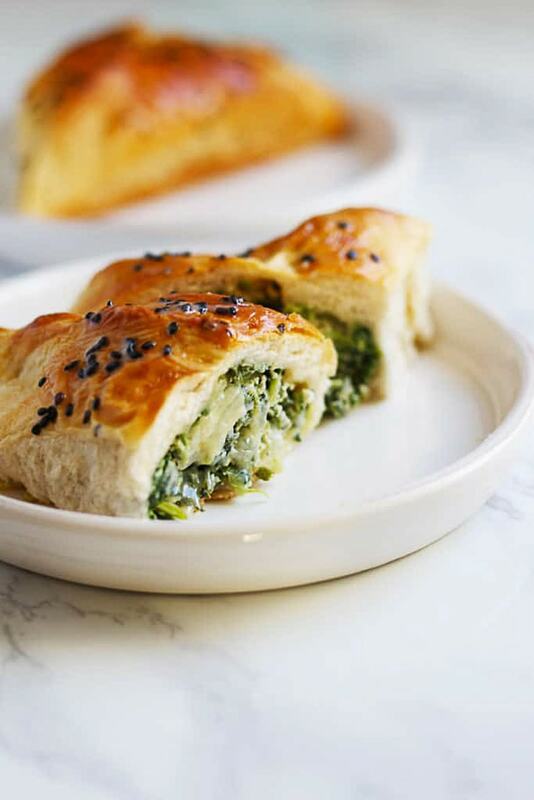 The use of spinach, parsley, and onion make us crave the filling, and the pastry dough makes us crave the outside! Admittedly, this recipe isn’t the healthiest option on this list. However, we would consider this one a healthy comfort food – and those are very necessary as well! You can find this awesome healthy recipe by Fusion Craftiness here. If you are very conscious of what you put into your body, you might consider animal products – like cheese or milk – a no-go. No matter! Here are some healthy recipes that you can try on a budget and that are 100% vegan. We’ve actually been eating more grains, beans, and veggies lately and we love it. 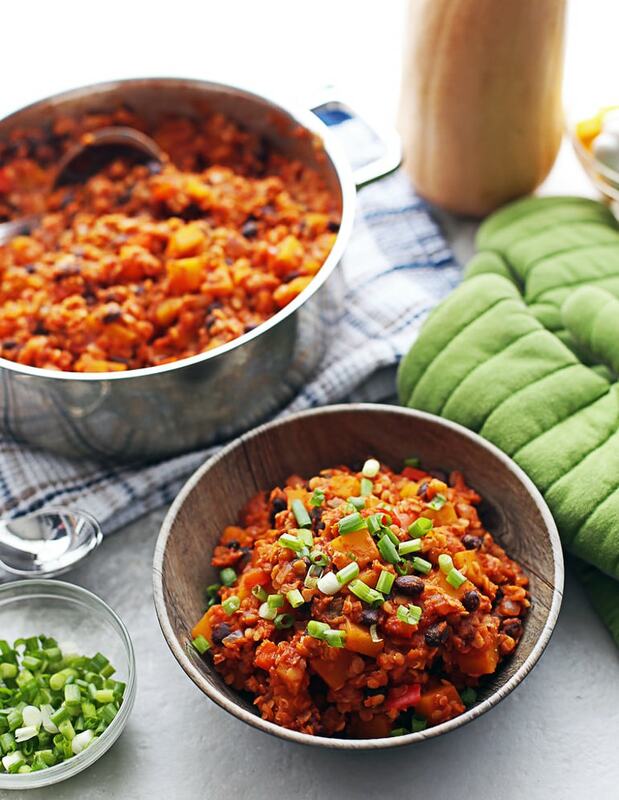 We’ve mentioned that Lisa is a fan of sweet potatoes – so this recipe caught our eye. 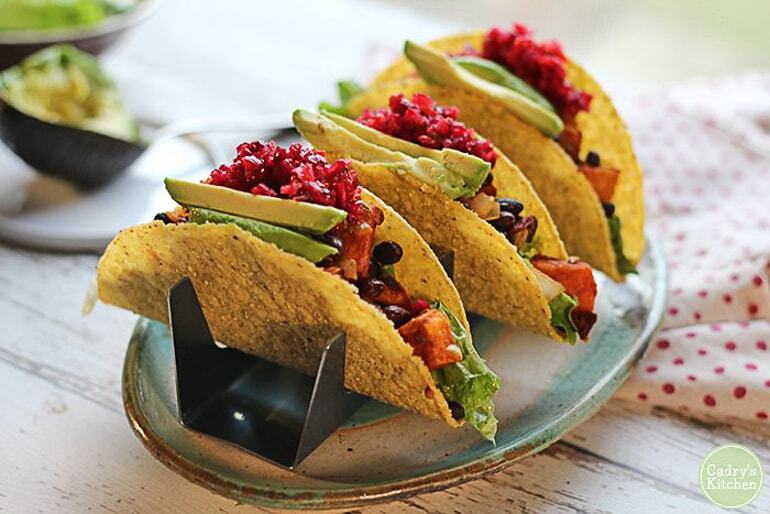 These tacos are filled to the brim with hearty black beans and even avocado for a fresh but filling flavor combination. They can be done up with a cranberry salsa, a variety of spicy peppers, and are even gluten-free and vegan! You can find this awesome healthy recipe by Cadrys Kitchen here. We honestly make dhal pretty often – Lisa really likes it and Bruce is into hearty food that gets him full so win-win! 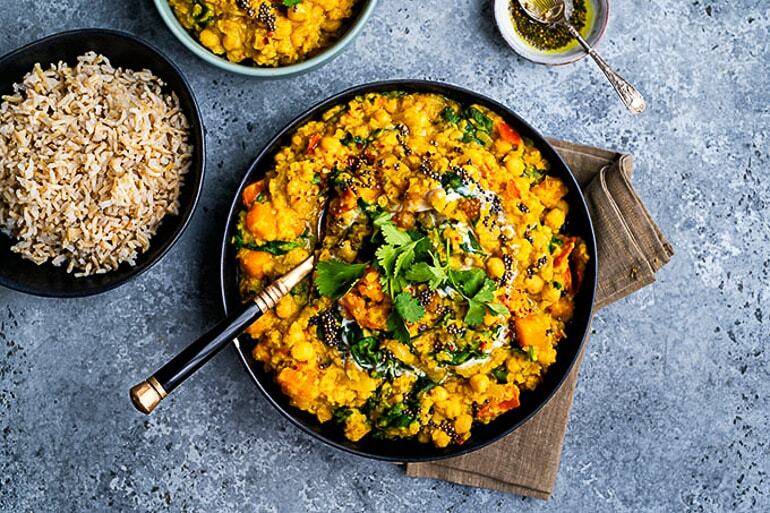 This one-pot lentil, squash, and chickpea dhal definitely fits that category! This recipe ends up pretty mild so be sure to up the spice if you like – and it can also be done in crock pot if you’re not feeling the stove top! Apparently it tastes better the next day – and we can vouch for this being the case when we make dhal, too! 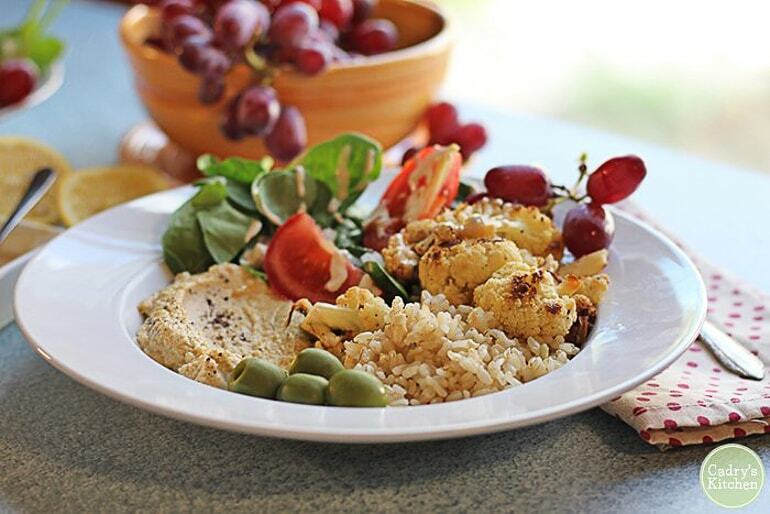 Anything with hummus is okay in our books, so check out this simple brown rice bowl recipe. It’s loaded with color from the olives to the spinach and grapes. It’s naturally vegan as made but you can also make it gluten-free if you choose to eat it without a pita on the side! The lemon tahini dressing drizzled on top sounds delicious so we are looking to try this one very soon! 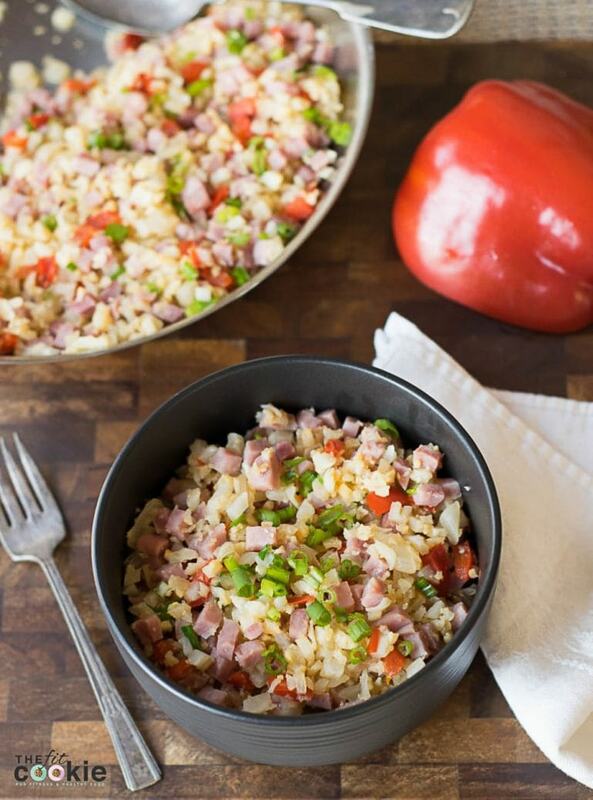 If you want a super easy dish to prep and serve, a simple vegetable fried rice is in order! This recipe lets you use basically any style of rice – so long as it’s not a sticky one. The sauce is a fusion of garlic, ginger, and other amazing flavors that mash together well. Just remember to finely chop those vegetables so they get a chance to saute in the high heat to stay the perfect tenderness! You can find this awesome healthy recipe by Sanhya Hariharan here. 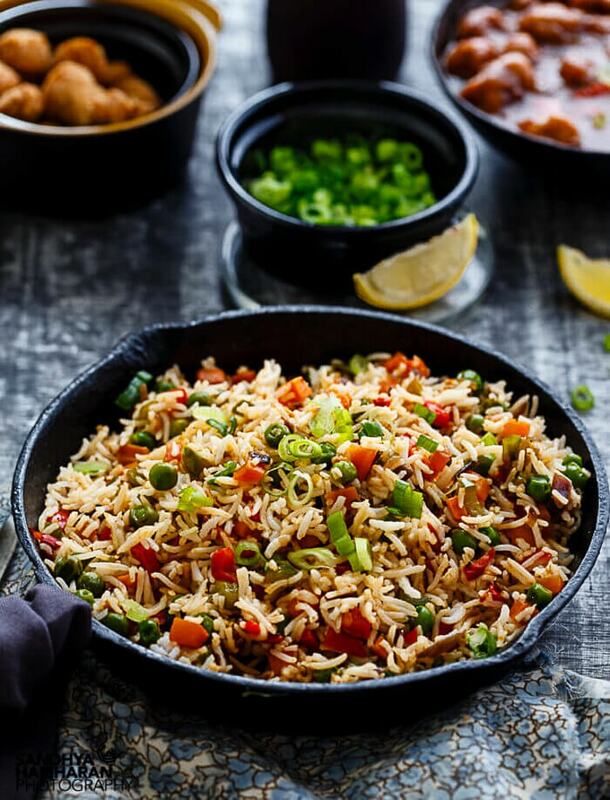 If you are looking for a meal that is quick to prepare and easy to make, a vegan jambalaya is for you. This recipe calls for a meatless way by using falafel – which seems like a great idea. You don’t even have to make the falafel yourself which can save time. The rice and vegetables come together for a hearty, flavorful dish that is filling and pleasing on the eye! You can find this awesome healthy recipe by Greedy Gourmet here. 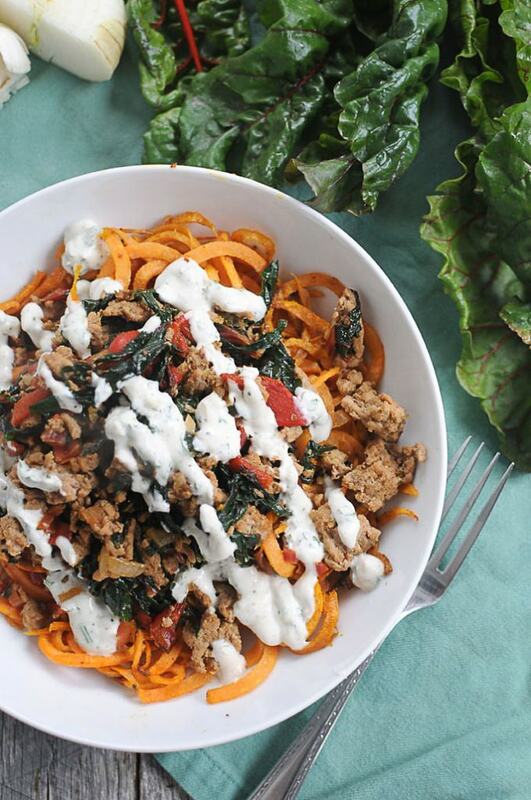 If you want a dinner packed with plant-based protein, then this might be the one for you. 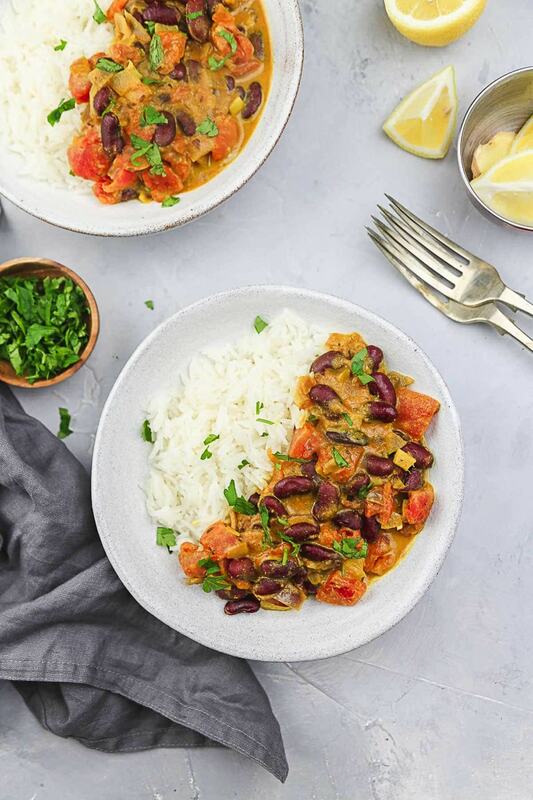 This kidney bean curry is also gluten-free and vegan so you can feel good about your choice of meal! It is served up with a side of rice and some freshly chopped parsley or a big squeeze of lemon juice! It also stores well in the fridge making it a hearty choice to have as leftovers. You can find this awesome healthy recipe by Little Sunny Kitchen here. If you need a side-dish that can also do fine on its own, check out this warm potato salad. Served up vegan, it incorporates chickpeas and a variety of greens (like spinach or arugula but you can choose what you like best). It’s topped off with rosemary and basil to give it some great flavors and aromas. 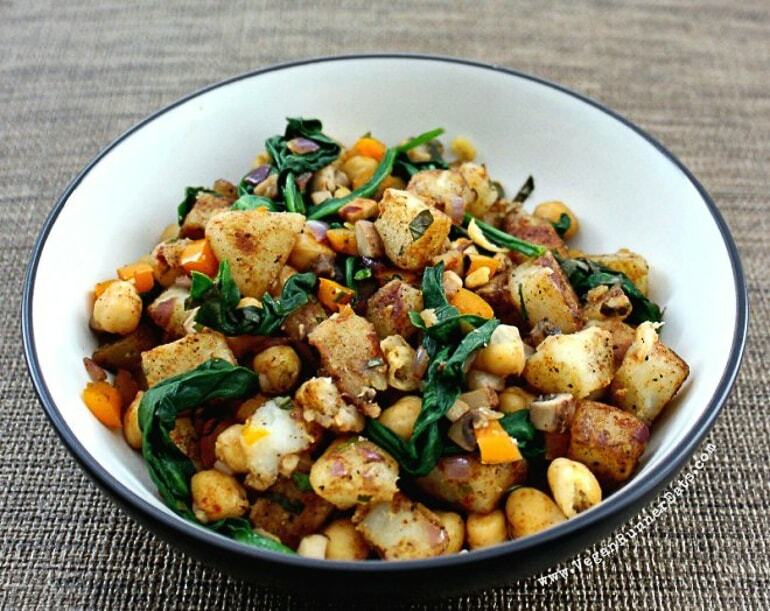 Lisa is a huge fan of healthy potato salads, so this is another dish we’ll try out soon! You can find this awesome healthy recipe by Vegan Runner Eats here. 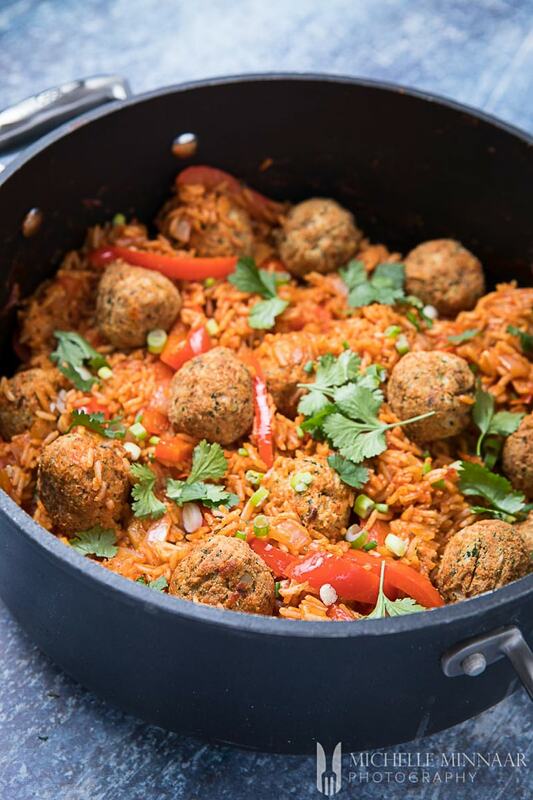 A tomato and rice stew done with Indian spices?! Sign us up! This hearty recipe calls for chickpeas, regular green peas, and caramelized onions – which is an important step to enhance the overall flavor! It’s super easy to whip together because it’s done in just one pan. Just let the thing simmer until it’s done and serve! You can find this awesome healthy recipe by Veganosity here. We feel like butternut squash is one of those ingredients you hear about but you have to know how to prepare it to get the most out of it. Well, this recipe calls for butternut squash – but is simple to execute! This one-pot vegan chili, complete with lentils and loads of vegetables, is a hearty way to get in a warm meal on a cool day. It also freezes well so you can make more, portion it up, and eat it later! You can find this awesome healthy recipe by Yay For Food here. 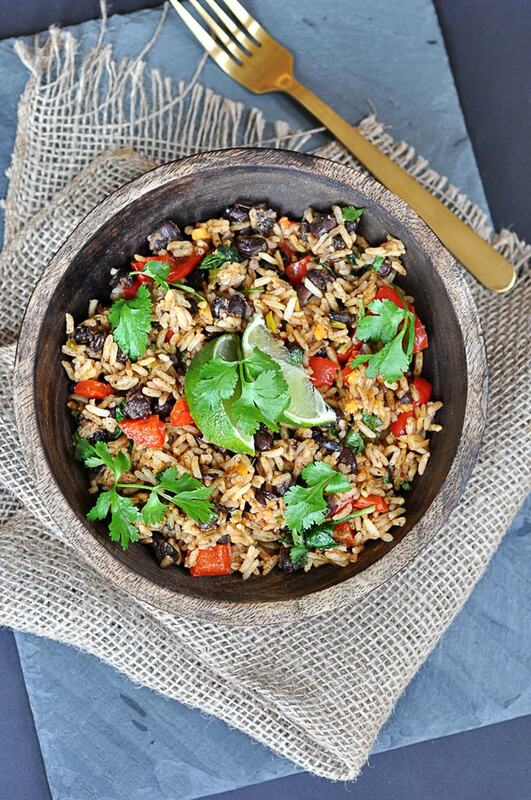 Using black beans and brown rice is a great way to load up on both fiber and protein – and you get both in this recipe! To cut down the heartiness (even though it’s a good thing), this recipe adds loads of vegetables. Don’t forget to top it off with cilantro (optional to taste). Back on the soup train, here’s another very customizable recipe. 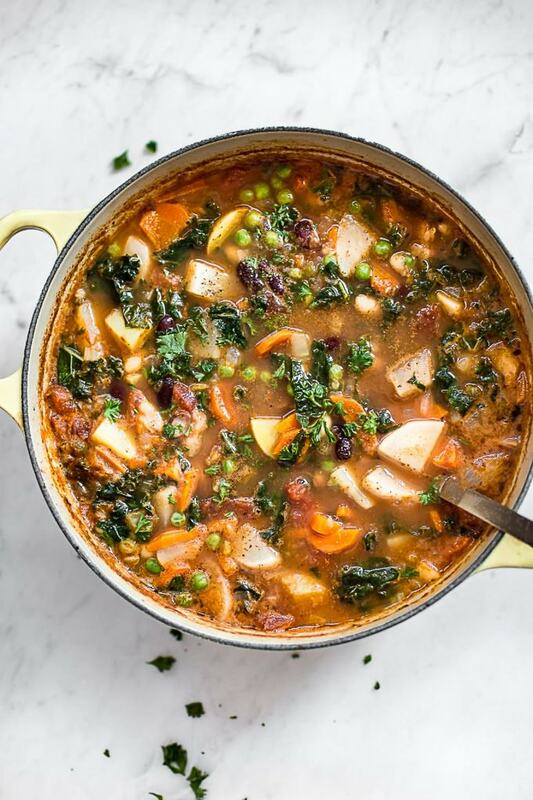 This healthy and hearty vegetable soup calls for lots of rich vegetables (whichever you have on hand, basically) and freezes well so you can store it for later! Of course, it’s made vegan here – and if you don’t like turnips you can always substitute them! You can find this awesome healthy recipe by Salt and Lavender here. Last, and certainly not least, we have a hearty one-pot mixed bean chili. This chili recipe is done gluten and oil-free and can be served up on its own for any meal or with tortillas! 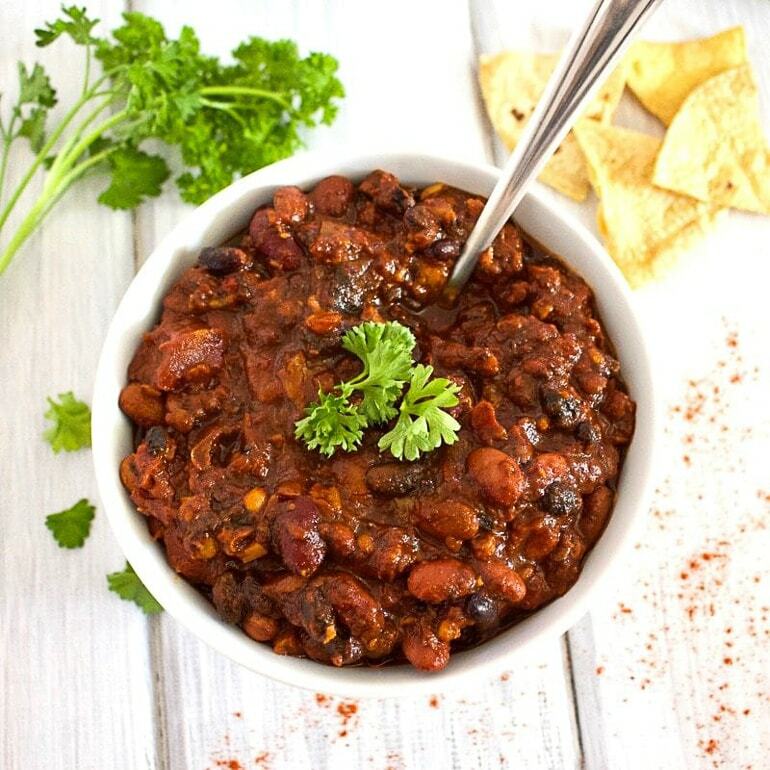 The beans also make this chili loaded with protein and fiber in every serving. Because it’s done up on one pot, you cut down on the mess (which is always a good thing). You can find this awesome healthy recipe by Vegannie here. And there you have it – 27 healthy meals to suit all tastes – and on a budget! There are so many more recipes out there but we’re excited to try out a few of these ourselves. A huge shout out to the food bloggers who shared their recipes – be sure to go and check them out for more foodie inspiration!